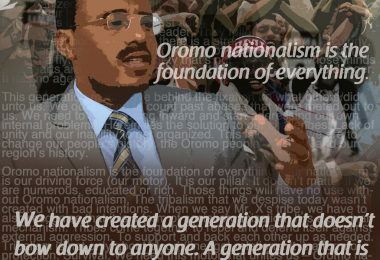 (OPride) — In his recent piece, “How Ethiopia Is Shaking Off Its Famine-Stricken Image,” AP’s Ethiopia correspondent Elias Meseret portrayed the country’s current rulers as visionary leaders who pulled millions of Ethiopians out of misery. Meseret uses plans for yet another mega construction project as a jumping off point: Ethiopia is planning to build a new multibillion airport in order to increase the Bole International Airport’s capacity by four fold. The airport we are planning to build is going to be huge. Very huge…. It will be one of the biggest airports in the world. I don’t know what other countries are planning in this regard for the future but no country has created this much capacity so far in Africa. Ethiopia, once known for epic famines that sparked global appeals for help, has a booming economy and big plans these days. The planned airport is one of several muscular, forward-looking infrastructure projects undertaken by the government that have fueled talk of this East African country as a rising African giant…. Addis Ababa increasingly looks like an enormous construction site, with cranes and building blocks springing up in many corners of the city. Meseret’s assertions clearly overlap with the authorities’ audacious claims. 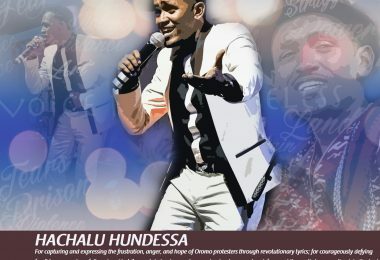 In fact, he expounded on the official statements as part of his expressed mission to promote the feel-good, “Ethiopia rising” story. It’s also one of those simplistic, Africa rising stories that the western media like to run from time to time as if to makeup for their otherwise sloppy coverage of the continent. 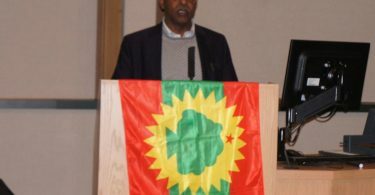 Needless to say, Meseret’s report was extremely biased and lacked any sense of balance. 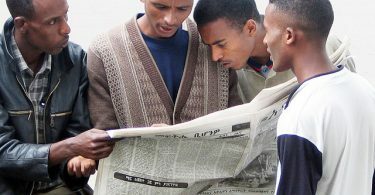 By abolishing free press and criminalizing freedom of expression, Ethiopian authorities have avoided closer scrutiny of their policies. The void is filled by opportunist local reporters who align themselves with the officials to either serve their own specific self-interests or to avoid risks of persecution. Similarly, foreign correspondents in Addis Ababa have shunned issues deemed sensitive and often regurgitate official statements for fear of harassment by the authorities or at times to align their coverage with geopolitical interests of their home countries. It is silly to juxtapose and present these two statements, directly quoting the authorities, without saying a word on the shocking extents of inconsistences. If the justification for the new airport is that the old airport has been engulfed by housing developments, then surely this raises another question: why keep expanding the existing airport by such a large magnitude? Why was residential development allowed to engulf Bole, given that land is the exclusive property of the government, which also owns and operates the airport? The housing developments themselves are mega construction projects, implemented by the government in the form of large-scale social housing developments or private developers who buy land from the government and also get permission to build around the airport. Clearly, this indicates the haphazard ways various construction projects are implemented without proper planning. Importantly, the reporter completely misses or deliberately overlooks the context for the circus about Bole airport. The latter is part and parcel the infamous Addis Ababa Master plan, which has been the source of simmering tensions for more than a year now. Mega construction projects have led to evictions of hundreds of thousands of farming households from their ancestral lands and destroyed their livelihoods. This has led to protests and clashes that ended up in bloodshed. Let’s take the Bole airport and examine some basic facts. Bole has two terminals. The second terminal is relatively new, its construction began in 1997 and it was completed in 2003 at a total cost of $130 million. At the terminal’s inauguration, it was announced that the new terminal was one of the largest in Africa, with a runway length of 4,725 metres and a capability to handle some 3,000 passengers an hour. Per Meserat’s report, the official justification given for building a new airport hinges on a claim that Bole is not meeting the rapidly growing demand, estimated at 6.5 million passengers a year. This implies that Bole has reached its full capacity. But how can one reconcile this with the 3,000 passengers per day figure announced earlier? Most international airports operate 24 hours a day and 365 days a year. 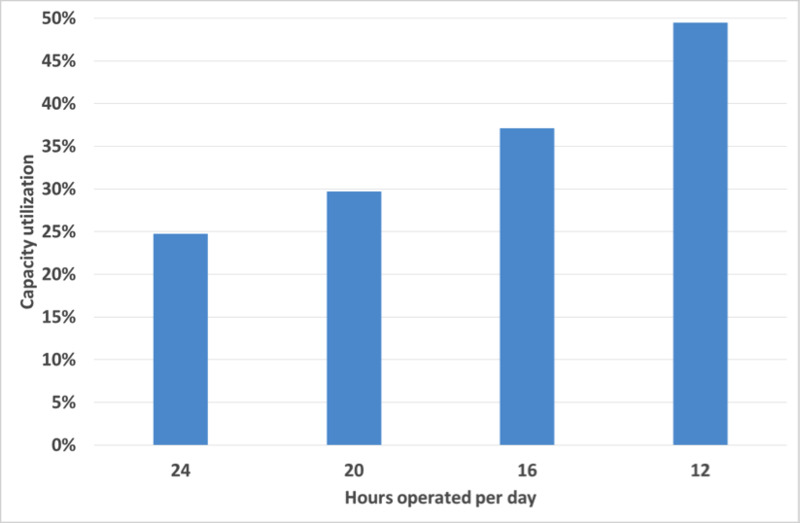 The chart below displays possible scenarios of total numbers of hours Bole International Airport remains open and serves customers. For instance, if Bole operates 24 hours per day, then it can serve just more than 26 million passengers per year. This would mean that it is currently utilizing only 25 percent of its total capacity, and hence there is no justification for expansion. Even if Bole operates only 12 hours per day, it could still serve more than 13 million passengers a year, which is still less than 50 percent of its full capacity. This is the kind of nuance that’s missing from Meserat’s rehashing of official talking points. Another way of looking at the rationale for Bole’s expansion is to compare its performance with similar airports in the region and around the world. This is done by collating data from disparate sources (as I have in the table below). Let’s begin by comparing Bole with Kenya’s Jomo Kenyatta International Airport (JKIA). But for a more accurate comparison of Bole and JKIA’s performances, I will compare the two with Standstead, a small airport outside of London. Runways are one of the most important limiting factors in facility at airports. Bole has two long runways. JKIA and Stanstead each have only one runway. In terms of runway length, Stanstead’s is the shortest of the three. In 2012, Bole and JKIA reportedly serve nearly equal number of passengers per year, i.e., 6.5 million. By contrast, even with its one, smaller sized runway, Stanstead served 17.5 million passengers in 2013, three times the number of passengers served by the two East African airports. In other words, as Stanstead’s case demonstrates, Bole could serve more than 17 million passengers with just one runway. This confirms my prior conclusion about Bole’s capacity utilization, i.e., Bole is probably utilizing only 25 percent to 50 percent of its full capacity. Given these facts, how would one explain the rush to build yet another mega airport at the cost several billion dollars? So far I used the 6.5 million passengers a year figure reported by the Ethiopian authorities. However, as illustrated in the table above, this figure does not stand up to scrutiny. While the total number of passengers served at Bole and JKIA are reportedly equal, the JKIA figure appears more credible. Tourists constitute the bulk of passengers served at major international airports. As such, the statistics on the number of passengers served by a given airport should be roughly compatible with tourist data. In 2010, about half a million tourists arrived in Addis Ababa, while some 1.5 million arrived in Kenya via JKIA during same year, according to the World Bank. This shows that JKIA serves at least three times the number of tourists passing through the Bole airport. Information on airline movements is not available but we know how many airlines regularly fly to Bole and JKIA. Bole serves 38 airlines, out of which only 13 actually fly to Bole through scheduled flights. The remaining 25 airlines work with Ethiopian airlines through codeshare agreements, whereby other airlines purchase or sale seats with the Ethiopian Airlines without any provisions of landing or taking-off services. By contrast, JKIA serves 58 major airlines, with 31 scheduled flights to JKIA and 27 through codeshare. This means the number of airlines with scheduled flights to JKIA is more than twice the number of scheduled flights to Bole airport. More important, there are several major international airlines that have scheduled flights to JKIA, including Air France, British Airways, Emirates, KLM Royal Dutch Airlines and Lufthansa. Out of these airlines, only Emirates and Lufthansa maintain scheduled flights to Addis Ababa. If we combine the tourist data and the number of airlines serving the two airports, it then becomes difficult to accept the premise that Bole and JKIA serve equal number of passengers. Besides, it is a known fact that there are more headquarters of international organisations and UN agencies in Nairobi than in Addis Ababa. Similarly, it is untenable to argue that there are millions of Ethiopian tourists travelling abroad. In 2008 Bole and JKIA served 3.33 and 4.75 million passengers respectively. Since then Bole and JKIA experienced 95 percent and 36 percent growth in passenger numbers in that order. But how can Bole’s explosive growth in passenger numbers be explained? There has been no change in Ethiopia’s tourism sector during this period. The authorities’ narrative of “explosive” GDP growth cannot be taken seriously. In normal circumstances, the construction sector is subservient to the needs of the overall economy. In other words, public construction projects are launched mostly when the requirements of other economic sectors necessitates it, or to expand gaps in capacity to stimulate economic activities. All of that is primarily geared toward creating material wealth and improving the living standards of the country’s citizens in equitable manner. In Ethiopia, this logic has been turned upside down – expansive construction projects are being launched without taking into account the need or affordability of the country’s economy. The foregoing discussion on the Bole airport is one such example. As discussed, the available evidence on the whole indicates that there is little for building another mega airport. In fact, as I have illustrated here, the existing airport is operating considerable below its full capacity. Even without the numbers and figures I provided, it’s easy to see that Bole operates below its full capacity. I have travelled reasonably well to different parts of the world, but Bole is perhaps the quietest major airport I recall passing through. As I wait in departure terminals, I do not see many aircrafts landing and taking off. When I arrive, I rarely see any other airliner parked on the tarmac, except for a few Ethiopians dotted here and there, with lots of empty parking spaces between them. The comparative analysis above only validated my subjective assessments. The regime uses large construction projects as a double edge sword, as discussed here. It suffices to say that the motivation for mega projects lie in crony business interests among politicians and business elites, who happen to be the same ethnic background. Small group of elites control the commanding heights of the Ethiopian economy. They have created large and complex civilian and military engineering companies, which need large construction contracts to thrive. Long before they have completed one mega construction project, opportunities to start yet another mega project has to be created, mainly by manipulating facts on the ground to justify upcoming projects and continuity of business opportunities. In this case, the Bole airport passenger numbers had to be manipulated and inflated a few years back to justify its envisaged expansion. In addition to serving narrow business and political interests, large construction projects are also used as a means of siphoning off public funds. Large construction projects in and around Addis Ababa have created a façade of economic boom taking place in Ethiopia. This is by far the most important explanation for Ethiopia’s construction-driven economic policy during the last decade. This is not to suggest all construction is bad. However, the emphasis on public works projects had starved the rest of Ethiopian economy. Agriculture remains among the most neglected sectors. To understand this point, one needs to look beyond official statistics on agricultural output and examine consumer prices of agricultural products in both rural and urban areas. Authorities in Addis Ababa shamelessly cite “high income among consumers and improvements in their standard of living” as a reason for the crisis in the agricultural sector, particularly the skyrocketing prices of foodstuff that consumers have to bear. This could not be further from the truth. The high consumer prices are fuelled by agricultural supply shortage relative to considerable expansions in the non-productive service sector, particularly public administration and defense. To add insult to injury, reporters like Meseret work hard to link the construction boom with famine and poverty reduction. But what has construction got to do with famine? How would Ethiopia ever shake off famine without actually tackling poverty at its roots? It does not produce food after all, it has the weakest link to agriculture – it does not use raw materials or supply inputs to agriculture. We are not talking about agro-processing or fertilizer manufacturing industry. In reality, the construction boom has been used to gloss over and hide the dire state of agriculture, rampant famine and poverty among millions of destitute households in rural and urban Ethiopia. I disagree with Meseret’s assertion that Ethiopia is shaking off its famine-stricken image. What the authorities are doing is actually to use mega construction projects to camouflage Ethiopia’s famine-stricken image. * The writer, Ayele Gelan (PhD), is a research economist at the Kuwait Institute for Scientific Research (KISR). He can be reached for comment at augelana@gmail.com.